Harry Houdini Research Papers account for his life, and his career as a magician. This is a Harry Houdini topic suggestion from Paper Masters. Use this topic or have our writers compose a custom research project on the famous magician. You can study Houdini from a historical perspective or even a marketing angle, as he marketed himself expertly in his trade as an illusionist. Harry Houdini was born Erich Weiss in Budapest in 1874, an immigrated to the United States as an infant with his parents. As a teenager, he was fascinated with the Memoirs of Robert-Houdini, who had become France’s greatest conjurer. At the age of fifteen, he had to leave school to work in a factory in order to help support his parents. At seventeen, he believed that he could earn more money with a magical act and billed himself as Houdini the magician playing at fraternal meetings and beer halls with a partner and later his brother. During this period of apprenticeship in the magician’s trade, Houdini gradually developed an uncanny knharyack for gauging the expectations of the audience and delivering a performance that made a strong impression on the audience. He found that an audience reacted more favorably to a conjuring act if some type of additional prop was used to mystify them. As a result, he began to experiment with various types of escape techniques. He developed an illusion that he called the Metamorphosis, in which a spectator bound Houdini’s hands, helped tie him into a bag, and locked him in a box. A curtain would close, and reopen a moment later to reveal Houdini standing unbound on the stage, while his assistant was tied in the box. The success of this type of performance enabled Houdini to prosper and eventually but an interest in a burlesque show. 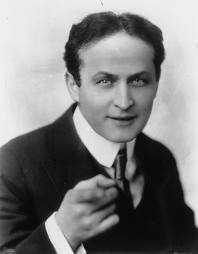 Throughout his career, Houdini recognized that publicity was an essential component to his success. Houdini constantly sought headlines in the press with his daring escape exploits. Houdini was also able to plant stories in the press regarding his exploits and his involvement with ongoing controversies, such as the authenticity of spiritual mediums. Houdini developed an interest in aviation shortly after the Wright brothers’ first flight, and became famous for making the first sustained airplane flight in Australia in 1910 while on tour. Because of the widespread interest in magic and spirituality that had developed at the time, he had little trouble gaining fame, which eventually led the public to consider him as the foremost magician in the world. By the time Houdini was beginning to attract notice as a magician, vaudeville was maturing as an entertainment medium and cultural phenomenon. It was primarily an urban experience, with vaudeville houses sprouting in the major cities across the United States. Some of the larger vaudeville house operators owned chains, and established circuits that required performers to travel from city to city. The traveling medicine show serviced smaller communities, featuring one or two relatively inexperienced entertainers that were essentially training for the larger vaudeville stages. By 1900, there were approximately 2,000 major vaudeville houses in the United States and Canada, which required a steady stream of performers. Ragtime - Ragtime Research Paper examines a novel about a time period that was one of great change, progressive era between 19th and 20th centuries. Paper Masters writes custom research papers on Harry Houdini and account for his life, and his career as a magician.